The Neumann TLM 103 Studio Condenser Microphone offers the world-renowned classic Neumann sound at an affordable price and would be the perfect addition to your recording studio. The Stereo Set option comes with two Neumann TLM 103 Microphones, two Neumann EA 1 Elastic Suspension mounts and an Aluminium Case. The Neumann TLM 103 is a large diaphragm condenser microphone with a cardioid polar pattern that sets a new benchmark in providing the highest quality recording at an affordable price. Whether in a home studio set up or commercial recording studio, the TLM 103 is perfectly equipped to handle it all. 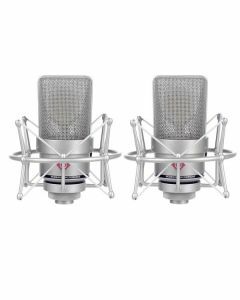 Its capsule is based on the classic Neumann microphones of the past and its low self-noise and cardioid polar patterns give you everything you need in a studio environment. The single polar pattern found in the TLM 103 means that Neumann has been able to fully optimise the microphone for cardioid recording set ups, giving the user an uncomplicated workflow. Due to the fact that the majority of recording situations call for this polar pattern, the TLM 103 will be a real workhorse in your studio. At just 7 dB-A, the TLM 103 has extremely low levels of self-noise, meaning that the classic Neumann sound is achieved with previously unattainable levels of clarity. Added to the fact that this transformerless microphone (TLM) prevents RF interference, the cleanest sound is virtually guaranteed. Neumann TLM 103 – Classics reborn! The K 103 large diaphragm capsule found in the TLM 103 is based on the K 87 that is found in such classics of the past as the U 67 and the U 87 – microphones that gave Neumann its unbeatable reputation in the music recording industry. Like those timeless models, the TLM 103 is ideal for recording either music or speech. The TLM 103 connects via a 3 pin XLR F cable, can be paired with a large range of accessories and its solid construction means this microphone will never let you down. Bringing the classic Neumann look and feel to all levels of the music recording industry, the TLM 103 has the capabilities to carry on the traditions its predecessors have set at great price for everyone.